آشوری, محمد رضا, قاسمی قلعه بهمن, احمد, کوکبی, محمد جواد. (1396). افزایش پایداری به نویز در شناسایی پارامترهای عیب تورق در صفحات کامپوزیتی با استفاده از روش هیبریدی. علوم و فناوری کامپوزیت, 4(2), 125-134. محمد رضا آشوری; احمد قاسمی قلعه بهمن; محمد جواد کوکبی. "افزایش پایداری به نویز در شناسایی پارامترهای عیب تورق در صفحات کامپوزیتی با استفاده از روش هیبریدی". علوم و فناوری کامپوزیت, 4, 2, 1396, 125-134. آشوری, محمد رضا, قاسمی قلعه بهمن, احمد, کوکبی, محمد جواد. (1396). 'افزایش پایداری به نویز در شناسایی پارامترهای عیب تورق در صفحات کامپوزیتی با استفاده از روش هیبریدی', علوم و فناوری کامپوزیت, 4(2), pp. 125-134. آشوری, محمد رضا, قاسمی قلعه بهمن, احمد, کوکبی, محمد جواد. افزایش پایداری به نویز در شناسایی پارامترهای عیب تورق در صفحات کامپوزیتی با استفاده از روش هیبریدی. علوم و فناوری کامپوزیت, 1396; 4(2): 125-134. روش‌های ارتعاشی از جمله روش‌های مرسوم عیب‌یابی غیرمخرب برای شناسایی پارامترهای عیب است. یکی از مهم‌ترین مشکلات استفاده از روش‌های عیب‌یابی ارتعاشی، حساسیت پایین آن‌ها در حضور نویز می‌باشد. در کار حاضر روش عیب‌یابی هیبریدی برای افزایش پایداری نسبت به نویز ارائه شده است. بدین صورت که ابتدا ناحیه اولیه عیب توسط تبدیل ویولت شناسایی شده و سپس با استفاده از روش بروزرسانی مدل المان محدود مبتنی بر الگوریتم ژنتیک، پارامترهای کمی عیب شناسایی می‌شوند. از سیگنال نسبت انرزی کرنشی در دو حالت سالم و معیوب برای شناسایی اولیه و تقریبی محل عیب توسط تبدیل ویولت و از سیگنال اختلاف انرژی کرنشی به‌عنوان تابع خطا در فرآیند بروزرسانی استفاده شده است. با استفاده از این روش علاوه بر افزایش میزان پایداری نسبت به نویز، حجم محاسبات به‌میزان چشم‌گیری کاهش می‌یابد. در این فعالیت به مقایسه پایداری نسبت به نویز در دو روش بروزرسانی کلاسیک و روش هیبریدی مبتنی بر ویولت و بروزرسانی پرداخته شده است. نمونه مورد بررسی مدل المان محدود صفحه کامپوزیتی چند لایه با عیب تورق می‌باشد. Taha, M.R. Noureldin, A. Lucero, J. and Baca, T., “Wavelet Transform For Structural Health Monitoring: A Compendium Of Uses And Features”, Structural Health Monitoring, Vol. 5, No. 3, pp. 267-295, 2006. Kim, H. and Melhem, H., “Damage Detection Of Structures By Wavelet Analysis”, Engineering Structures, Vol. 26, No. 3, pp. 347-362, 2004. Gao, R.X. and Yan, R., “Wavelets: Theory And Applications For Manufacturing”, Springer Science & Business Media, New York, pp. 33-68, 2010. Jorgensen, P.E. and Song, M.S., “Comparison of Discrete And Continuous Wavelet Transforms”, Computational Complexity: Theory, Techniques, and Applications, pp. 513-526, 2012. Katunin, A., “Spatial Damage Identification In Composite Plates Using Multiwavelets”, Journal of Applied Mathematics and Computational Mechanics, Vol. 12, No. 3, 2013. Rucka, M. and Wilde, K., “Application Of Continuous Wavelet Transform In Vibration Based Damage Detection Method For Beams And Plates”, Journal Of Sound And Vibration, Vol. 297, No. 3, pp. 536-550, 2006. Yoon, M. Heider,D. Gillespie, J. Ratcliffe, C. and Crane, R., “Local Damage Detection Using The Two-Dimensional Gapped Smoothing Method”, Journal Of Sound And Vibration, Vol. 279, No. 1, pp. 119-139, 2005. 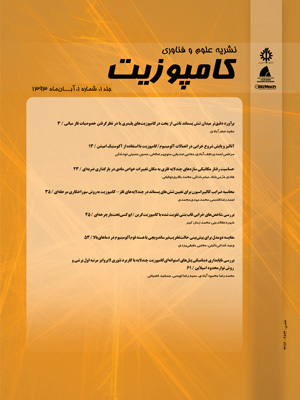 Bakhtiari-Nejad, F. and Bideleh, S.M.M., “Application of Continuous Wavelet Transform in Vibration-Based Damage Detection For Circular Cylindrical Shells”, In Persian, 5th Condition Monitoring & Fault Diagnosis Conference: Petroleum University of Technology, Abadan, Iran, 2011. Katunin, A., “Damage Identification in Composite Plates Using Two-Dimensional B-Spline Wavelets”, Mechanical Systems and Signal Processing, Vol. 25, No. 8, pp. 3153-3167, 2011. Cavalini, A. Franco, V. Gonsalez, C. Lopes Jr, V. and De Melo, G., “Noise Influence On Damage Detection Through Modal State Observers Methodology”, Trends in Applied and Computational Mathematics, Vol. 9, No. 2, pp. 195-204, 2008. Rodriguez-Rocha, R. Rivero-Angeles, F.J. and Gomez-Ramirez, E., “Limited Modal Information and Noise Effect On Damage Detection without Baseline Modal Parameters”, 27th Conference and Exposition on Structural Dynamics 2009, IMAC XXVII, 2009. Lee, H.C., “Robust Damage Diagnostic Method Using Short Time Fourier Transform and Beating”, Transactions of the Korean Society for Noise and Vibration Engineering, Vol. 15, No. 9, pp. 1108-1117, 2005. Torrence, C. and Compo, G.P., “A Practical Guide To Wavelet Analysis”, Bulletin of the American Meteorological society, Vol. 79, No. 1, pp. 61-78, 1998. Kaiser, G., “A Friendly Guide to Wavelets”, Third ed., Springer Science & Business Media, Boston, pp. 3-33, 2010. Qin, Y. and Zhang, S. and Zhang, C., “Combining kNN Imputation and Bootstrap Calibrated: Empirical Likelihood for Incomplete Data Analysis”, Exploring Advances in Interdisciplinary Data Mining and Analytics: New Trends, Chapter 16, pp. 278, 2011. Heil, C.E. and Walnut, D.F., “Continuous And Discrete Wavelet Transforms”, SIAM review, Vol. 31, No. 4, pp. 628-666, 1989. Burrus, C.S. and Gopinath, R.A., “Introduction To Wavelets And Wavelet Transforms”, Prentice Hall, New Jersey, pp. 401-420, 1998. Carden, E.P. and Fanning, P., “Vibration Based Condition Monitoring: A Review”, Structural health monitoring, Vol. 3, No. 4, pp. 355-377, 2004. Montalvao, D. Maia, N.M.M. and Ribeiro, A.M.R., “A Review Of Vibration-Based Structural Health Monitoring With Special Emphasis On Composite Materials”, Shock and Vibration Digest, Vol. 38, No. 4, pp. 295-326, 2006. Fan, W. and Qiao, P., “Vibration-Based Damage Identification Methods: A Review And Comparative Study”, Structural Health Monitoring,” Vol. 10, No. 1, pp. 83-111, 2011. Hu, H. Wang, B.T. Lee, C.H. and Su, J.S., “Damage Detection Of Surface Cracks In Composite Laminates Using Modal Analysis And Strain Energy Method”, Composite Structures, Vol. 74, No. 4, pp. 399-405, 2006. Hu, H. and Wu, C., “Development Of Scanning Damage Index For The Damage Detection Of Plate Structures Using Modal Strain Energy Method”, Mechanical Systems and Signal Processing, Vol. 23, No. 2, pp. 274-287, 2009. Marwala, T., “Finite Element Model Updating Using Computational Intelligence Techniques: Applications To Structural Dynamics”, Springer Science & Business Media, Johannesburg, pp. 203-224, 2010. Engelbrecht, A.P., “Computational Intelligence: An Introduction”, Second ed., John Wiley & Sons, South Africa, pp. 1-14, 2007. Koza, J.R., “Survey Of Genetic Algorithms And Genetic Programming”, Wescon Conference Record, Western Periodicals Company, pp. 589-594, 1995. Mottershead, J. and Friswell, M., “Model Updating In Structural Dynamics: A Survey”, Journal of sound and vibration, Vol. 167, No. 2, pp. 347-375, 1993.